This maintenance kit is designed for use in the Lexmark T650, T652, T654, X650, X652, X654, X656, X658 series printers. The kit includes a fuser, transfer roller, charge roller, and pickup rollers. You can save some money by purchasing the fuser on exchange; see exchange terms in details below. 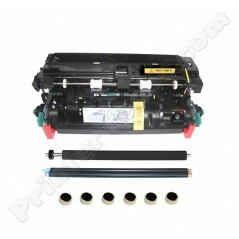 This maintenance kit is designed for use in the Lexmark T650, T652, T654, X650, X652, X654, X656, X658 series printers. The kit includes a fuser, transfer roller, charge roller, and pickup rollers.